The holidays are behind me, sales tax calculations are nearly complete and I've been continuing on developing the set of Spanish Flashcards and adding features to Memorize-it that increase my productivity. 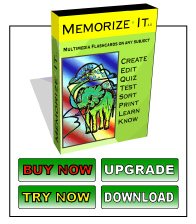 Those tools in turn will also increase your productivity when you use Memorize-It. The current cool feature I'm implementing is in adding cards a that are scrambled multiple choice. I'm using those card types in the testing decks for the new quizzer. The conversion was pretty slow because I needed to go find a couple of different items as the incorrect choices from the rest of the deck. I'm in the middle of adding a little pull down to the text boxes that show all the text strings in the current deck and allows you to choose from those. This will save a lot of time in that I will not have to go open another card to cut and paste some other spanish word, I can just select it from a list. I think it's going to be a very busy couple of months though. I've completely over committed my self in teaching, volunteering and at work. Better to be busy than slow and I always get more done that way, but this is looking a little ridiculous. Stay tuned, hopefully I find some way to stay out of the way of this giant mountain of work that is coming.